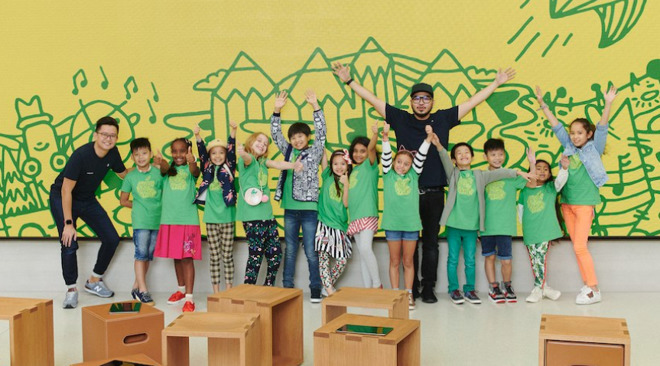 Apple on Monday opened up the first round of reservations for this summer's Apple Camp, an annual retail program aimed at teaching kids while simultaneously exposing them and their parents to Apple products. Reservations are currently open in the U.S., Canada, France, and several other countries for sessions beginning July 9 and cycling through July 27. Germany and the U.K. won't open reservations until June 25. The program is limited to kids aged 8 to 12, and involves three 90-minute sessions within a chosen track. This year there are three tracks. The first, "Coding with Sphero Robots," will teach different coding concepts to make Spheros change colors, produce sound, and complete various activities. As a final project, kids will design their own games. "Beat Making and Songwriting with GarageBand" will introduce elements of song structure and using an iPad to play and record songs. "Telling Stories with Clips," lastly, will get campers using the iOS app to produce media combining photos, video, music, and titles. Interested parents should make reservations quickly, as Apple Camp is free but first-come-first-served, with slots typically filling up fast. The program has been running in various incarnations since 2003. Over time Apple has switched out products and focus, for instance gradually transitioning from Macs to iOS devices, and dropping apps like iBooks and iMovie. Perhaps the most important transition came about in 2016, when it first began teaching coding using Sphero products. Since then Apple has hammered home efforts to teach programming to kids, teenagers, and college students, mostly by inserting a Swift curriculum into schools wherever possible. CEO Tim Cook has regularly called for programming to be a fundamental element of education — something from which the company would benefit in terms of app development and a future workforce.